Recombinant full length protein corresponding to Human Alpha-synuclein. Ammonium sulfate precipitated and dialyzed tissue culture supernatant. Our Abpromise guarantee covers the use of ab1903 in the following tested applications. IHC-FoFr 1/300. PubMed: 17227870Perfuse with 4% paraformaldehyde with 0.4% picric acid in 0.16 M phosphate buffer and postfix. WB 1/100 - 1/10000. Predicted molecular weight: 16 kDa. IHC-P 1/100 - 1/1000. Antigen retrieval is not essential but may optimise staining. Publishing research using ab1903? Please let us know so that we can cite the reference in this datasheet. I was wondering whether it is possible to ask for the peptides for immunization to produce this antibody since I see from a different question that the epitopes have not been mapped? 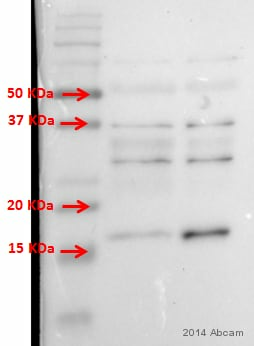 I would like to confirm that the epitope for this antibody has not been mapped and that the immunogen used was not a peptide but the full length protein. 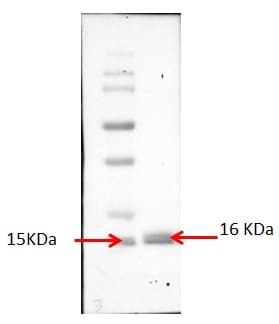 > ab138501: rabbit monoclonal antibody, KO validated, that binds to amino acids 118-123 (VDPDNE). https://www.abcam.com/ab138501. > ab27766: mouse monoclonal antibody that binds in the region encoded by amino acids 115-122 of alpha-synuclein. https://www.abcam.com/ab27766. Good afternoon Cold you please tell me if ab1903 (mouse monoclonal antibody to alpha Synuclein) recognises either non-phosphorylated or phosphorylated alpha synuclein, or both. Thank you for your email. We have not checked for specificity against the phosphorylated and non-phosphorylated form of alpha synuclein, therefore we do not have this information. If you do decide to test this antibody for specificity we would be happy to hear your feedback. We like to encourage all of our customers to submit an Abreview via the online product datasheet. We always appreciate customer feedback, whether positive or negative, and we make all product information available to researchers. Plus, each Abreview earns Abpoints that can be used for discounts on future purchases or rewards such as Amazon.com gift certificates. To find out more about our Abreview system, please see the following link: https://www.abcam.com/abreviews I hope this information is helpful. Please do not hesitate to contact me for any further advice or information in this regard. What are the epitopes recognized by each of these alpha synuclein antibodies? The epitopes that are recognized by the synuclein antibodies ab1904, ab1903, ab24717, and ab36615 have not been mapped. I am sorry we could not be of more help. If you have any other questions, please do not hesitate to contact us. 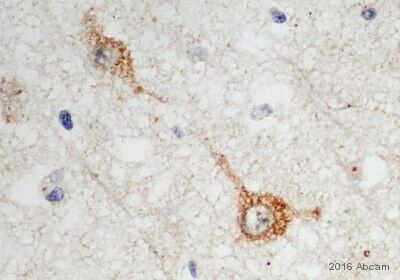 Customer is interested in using this antibody in IHC with mouse tissue; should a Mouse on Mouse kit be used? Thank you for your enquiry. We guarantee that this antibody will work in IHC and cross-react with mouse alpha synuclein. We would recommend using this antibody as per our general IHC protocol (protocols for both frozen and formalin-fixed paraffin-embedded sections can be found by clicking on the protocols tab located on the online datasheet). However, if after you experience problems with high background, using a Mouse on Mouse kit from Vector would be suggested. Please contact us again if you have any additional questions.